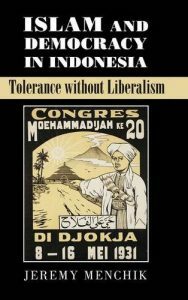 Review: What Lies Behind the Indonesian Brand of Tolerance? Indonesiaâs textbooks and government literature are extremely proud of Indonesiaâs claim to democracy without liberalism. Published in 2016, the book for Higher Education Instruction on Pancasila (Pendidikan Pancasila untuk Perguruan Tinggi) carefully describes the Indonesian world view (wawasan) as the compromise between capitalism and communism; a perfect balance between pragmatism and determinism. This balance is possible, as the government education curriculum argues, through Indonesiaâs unique cultural brand of religious tolerance and nationalism. Jeremy Menchik calls this political cocktail âGodly nationalismâ. Islam and Democracy in Indonesia takes a very valid and informative approach to exploring the possibility of tolerance without the western concept of liberalism. Menchik completed a number of years in Indonesia gathering samp les and surveys from Indonesiaâs (and the worldâs) largest Muslim organisations: Nahdlatul Ulama (NU) and Muhammadiya. Menchik determined through his surveys, the Muslim organisation magazine archives and in-depth interviews that Indonesiaâs brand of religious tolerance is not necessarily pragmatic nor stemming from a rational actor political persuasion. Even Indonesiaâs more hardline organisation, Persatuan Islam (Persis), which is also included in Menchikâs data, leaves room for religious tolerance if not nearly as much as the most tolerant of the three, NU. Aside from ethnic and regional differences between the highly influential Islamic organisations, which do have a noticeable influence on the level and brand of tolerance, Jeremy Menchik argues that historical events, colonial policies and to a great extent the respective leaders of each organisation have shaped the groupsâ  various interpretations of religious tolerance over time. Indonesia is as fiercely non-secular as it is adamantly opposed to theocracy. But by law, only faith systems that recognise a One High God (Tuhan yang Maha Esa), have a written scripture and prophet are accepted as religions. All other faiths are considered only as beliefs (kepercayaan) or worse, aberrant faiths, like the Islamic Ahmadiyya sect, which is tolerated less than non-Islamic faiths. Established and recognised religions, according to law, are âprotectedâ from proselytising. So, what exactly is the motive for Indonesiaâs brand of tolerance? Menchik speaks counter to Indonesiaâs national indoctrination curriculum when he states, âWhether the state celebrates pluralism or persecutes minorities may have more to do with processes of state-building and less to do with values (Kindel loc 947).â Tolerance is instrumental to the development of a peaceful state; one that supports progresses. I ndeed, Indonesiaâs opinion columns and political personalities often openly bash the failed strategy of Middle East Islam to attract not only non-Muslims to the faith but ensure a prosperous and stable community of diverse beliefs, languages and cultures. Once again, Indonesia is the test bed for political and social theory. Indonesiaâs evolution from hundreds of languages and cultures into a single nationalism was used by Benedict Anderson to showcase how communities are âimaginedâ and created. I am a fan of R. E. Elsonâs works on how 17,000 islands and dozens of competing histories and geographies were carefully interpreted to create the Archipelagic national identity of Indonesia (The Idea of Indonesia). Clifford Geertz compared Morocco to Indonesia in order to explain the differences between Islamic observance across the Muslim world where the latter developed a mystical Islam not based on counter-crusades, but instead was âadaptive, absorbent and pragmatic.â  Indonesia, perhaps, would prefer to call it tolerance as opposed to pragmatism. In Jeremy Menchikâs excellent book, Indonesia is the quintessential case study to put forward an alternative definition to western liberalism that resonates with cultures across Asia and Africa. Godly nationalism is not without its sticking points. Indonesia, as Menchik argues, showcases a truncated form of pluralism with the privileging of religious orthodoxy. But Indonesia is not secular Europe, which has a few of its own political experiments in religious tolerance. Indonesia is roughly 88% Sunni Islam. In the 1960s it was said that roughly two million abangan (syncretic) Muslims converted to Christianity after being unjustly targeted as Communist sympathisers. Christian organisations have been accused of extending their social welfare and church activities into areas that are predominantly if not exclusively Muslim. Tolerance, in a way, has its limits. Godly nationalism may not be able to stomach the possibility of voluntary conversion; at least not out of the religious majority. A good character of tolerance is also repentance, with forgiveness when necessary. During the previous tenure of General Gatot, Indonesiaâs chief of military (Panglima), as a means to galvanize a national identity, the threat of Communism was again introduced in force into social media, spurred on by the Panglima. Instead of a 2016-2017 red scare, many in NU leadership were willing to admit and repent of complicity in the killing and torture of millions during the 1960âs Communist hunt. The culture and context of events continues to shape Indonesiaâs nation-building tolerance. My own skeptical streak springs from John Esposito and John Vollâs excellent research on Islam and Democracy. How important is it that a majority believe in democracy if the minority detractors are still a significant if not large percentage themselves? Menchik is not blind to the f act that while a majority of Indonesiaâs Muslim elite will tolerate a Christian or Hindu holding political office in areas with respective Christian and Hindu majorities, there is still significant reservation to non-Muslims living next to Muslims or holding office in heterogeneous areas, and overwhelming concern for the same in Muslim majority areas. Indonesiaâs tolerance project still needs work, especially where only six religions are officially recognised; meaning only six religions receive government assistance, oversight and to a certain extent, protection. My own skepticism is balanced, as is Menchikâs, in considering the tolerance data of liberal democracies like the US. Needless to say, a Muslim running for political office or even the presence of a Muslim neighbor in a predominantly non-Muslim neighbourhood is still going through growing pains in a society of liberal tolerance. I am reminded that a nationâs laws, be they Indonesiaâs or Americaâs, while necessary, do not predict the behavior of the community. The law cannot change hearts. As much as Indonesiaâs Pancasila philosophy remains the basis of law and national identity, it is not free from threats. Lembaga Ketahanan Nasional (National Defense/Resilience Institute) measures the strength/resilience of the nation each year, by province, according to a number of social and political indicators. The latest report (2017) reveals that Indonesiaâs core concepts of kerukunan (harmony), pluralism and mutual respect of cultural diversity are the most under threat. The above instituteâs data jives with a recent (24 April 2018) survey published in the New Mandala where despite the variety of political parties, the one main platform difference between them all is what each believes to be the proper/healthy influence of religion in politics. What makes Indonesia positively unique, also the example of Menchikâs godly nationalism, is the axis on whic h political party divergence spins. The source of national identity is at the same time the subject of the nationâs hottest debates. One could say the same for many countries, not just Indonesia. Other than the influence on national unity and character, what part does godly nationalism in Indonesia have to play in its foreign relations? Unlike other national ideologies like Liberalism, Communism and Marxism, Indonesia claims that its Pancasila world view is not up for export. If Indonesiaâs concept of tolerance stands the test of time, in what way can/does it apply to a strategy of soft-power in its foreign policy? Indonesia is an up-and-coming world economic and political power. How will its national identity influence that power? Caleb Slayton is a Major in the United States Air Force currently studying at the Indonesian Air Command and Staff College. He researches and writes on religious dynamics and security in Sub-Saharan Afr ica and Southeast Asia. The views expressed are those of the author and do not reflect the official policy or position of the US Air Force, Department of Defense or the US Government.